De Gregorio has carved out an impressive reputation for quality, design and dedication, so the innovative and affordable Chanela would be a great choice for you to discover the possibilities of these fascinating instruments. Dual snare system. High quality construction. Versatile. No option to turn snares off. 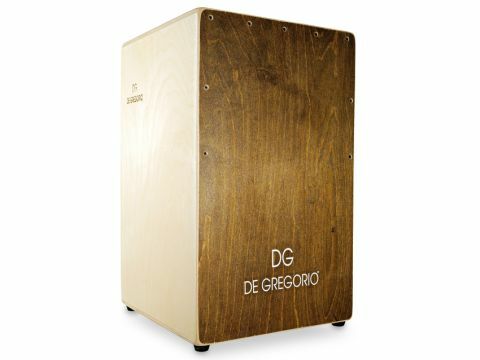 It's been a while since we've taken a peek at Italy's most revered cajon manufacturers De Gregorio, and they've been busy making their beautiful creations even more user-friendly. DG's Zambo and Yaqui models caused major waves with us last time around, and now with the Chanela, these talented craftsmen have stirred it up once more! The Chanela is constructed from Baltic Birch and stands 49cm tall, with both depth and width measuring 29cm. The five-ply birch Tapa (or frontplate) is only 2.5mm thick, and comes in a choice of six beautiful finishes: natural, black, green, blue, red and brown - just like our review model. All other aspects are in a natural finish, and the eco-friendly water-based stain allows the frontplate's birchwood grain to subtly shine through. The biggest revelation is the inclusion of two independently adjustable sets of strings (along with four removable Velcro muting strips per side) behind the Tapa, and each set of four is tensioned via the internally housed Allen key at both the top and bottom of the cajon. The whole snare system can be taken out in minutes without the headache of having to remove the frontplate, so if you do happen to break a string at some point, then fear not! The Chanela is a highly articulate instrument that has a uniformly wide tonal palette, with impressive bass, strong mids and a snappy high frequency response - but with a noticeably more subtle snare sound that doesn't overwhelm the performance of each stroke. The adjustability factor means that the player has more options when it comes to customising the snare effect. If, for instance, you experiment with the placement of the Velcro strips while trying different tensions between the two snare sets, you can achieve a greater snap to the strokes in the upper portion and less so in the mid to lower areas. Many cajons have little to no control over the snare sound, and their blanket effect right down the frontplate can often be less than satisfying. So even though you can't actually switch the snares off (as with DG's Zambo cajon) the Chanela provides an impressive middle ground. De Gregorio's Chanela is a top quality, beautifully constructed and intelligently thought-out instrument that is rewarding to play. The myriad of tones possible will not disappoint, and its versatility will make it at home on any stage, regardless of a particular musical style. The dual snare systems are certainly a most welcome feature and give you wider scope for tweaking the snare effect at different spots on the frontplate.